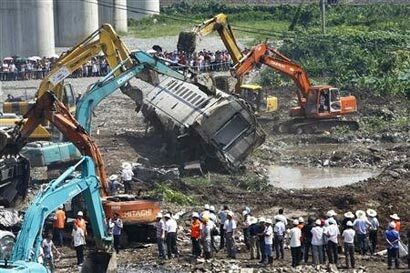 WENZHOU, China (Reuters) – China sacked three senior railway officials on Sunday after a collision between two high-speed trains killed at least 43 people and raised new questions about the safety of the fast-growing rail network. A bullet train on Saturday night hit another express which lost power following a lightning strike, state media said, in the country’s deadliest rail disaster since 2008. The power failure knocked out an electronic safety system designed to alert trains about stalled locomotives on the line. As rescue teams and firefighters with excavators searched for survivors, state television said a 4-year-old boy and a male toddler had been pulled alive from the wreckage. It was not known how many people were on the trains, which collided on a bridge near the city of Wenzhou in Zhejiang province, some 860 miles south of Beijing. Authorities moved quickly to assuage public anger by sacking the head of the Shanghai railway bureau, his deputy and the bureau’s Communist Party chief, the Railways Ministry said in a statement on its website (www.china-mor.gov.cn). The three will “also be subject to investigation,” the statement added. Rescuers found more bodies on Sunday afternoon, bringing the death toll to 43. Almost 200 people remain in hospital, 12 of them in critical condition, the official Xinhua news agency said. Two foreigners died in the accident, according to the semi-official China News Service, including a woman in her 20s. Rail is the most popular method of long-distance transport in China and trains are usually crowded with as many as 1,000 passengers. The reliability of China’s rail network was called into question recently when the flagship Beijing-Shanghai high-speed line suffered a series of power outages soon after opening to great fanfare a month ago. China’s rail network has also been hit by a series of scandals. Three railway officials have been investigated for corruption this year, according to local media reports. In February, Liu Zhijun was sacked as railways minister for “serious disciplinary violations.” He led the rail sector’s investment drive over the past decade. Chinese internet users took to popular Twitter-like microblogging site Weibo to vent their anger about the accident, with some calling for Railways Minister Sheng Guangzu to resign, posting his picture online with a large red cross through it. “The Railways Ministry should realize that passengers are not just little white mice,” wrote Yang Chunxiao. “Do you think officials are really trying to help? It’s all for show,” added A Cige. One train was heading from Beijing to the coastal city of Fuzhou, and the other was running from Hangzhou to Fuzhou. Both trains were made by China South Locomotive and Rolling Stock Corp Ltd (CSR). “Only when we got down, we saw so many train carriages falling down,” Yu said. In 2008, an express train traveling from Beijing to the eastern coastal city of Qingdao derailed and collided with another train, killing 72 and injuring 416 people.